Golden Heavy Body Artist Acrylics are known for their exceptionally smooth, thick, buttery consistency, and for their excellent permanency and lightfastness. These paints have the ability to "stand up" and retain brush strokes or palette knife marks on the canvas. Phthalo Blue PB15:3 is a structural variant of Phthalo Blue PB15 that produces more greenish tones. 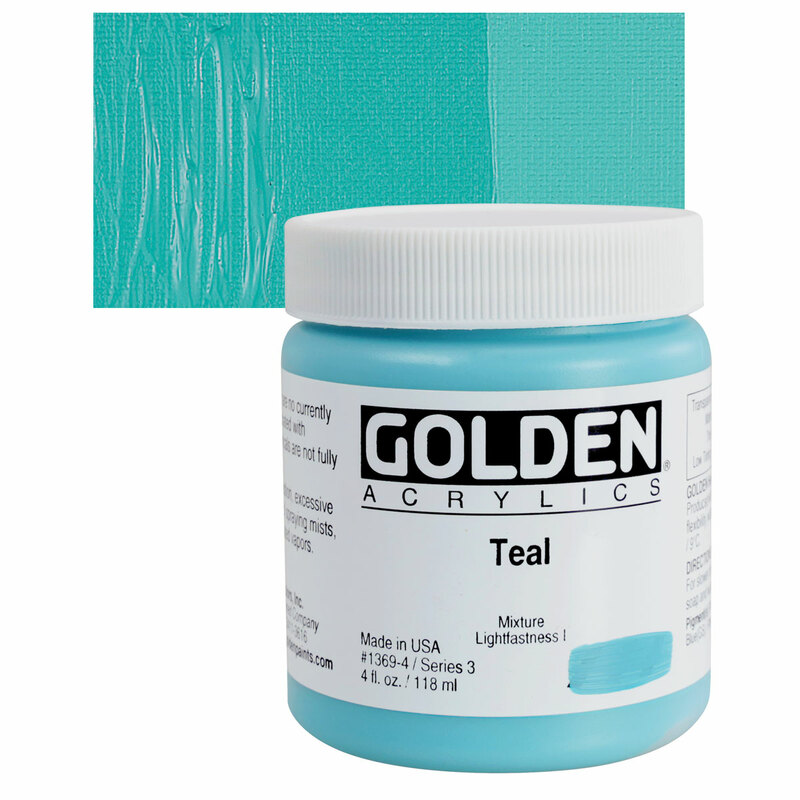 Phthalo Blues are completely lightfast and stable and are permanent for all paint uses. They are currently used in inks, coatings, and many plastics due to their stability and are considered a standard pigment in printing ink and the packaging industry. Phthalo Blues have no significant hazards, although those made before 1982 contained some PCBs (polychlorinated biphenyls). Developed by chemists using the trade name Monastral Blue , the organic blue dyestuff now known as Phthalo Blue was presented as a pigment in November 1935 in London. Its discovery was accidental. The dark color was observed in a kettle where a dye was being made from a British dyestuff plant. The demand for such a pigment came from commercial printers who wanted a cyan to replace Prussian Blue. Titanium White is the most brilliant of the white pigments. It is considered an all purpose oil color useful in all techniques and the best all around white. Its masstone is neither warm nor cool, placing it somewhere between Lead White and Zinc White. It is less prone to cracking and yellowing than Lead White, but it still yellows easily. Titanium White dries slowly in oil form, more slowly than Lead White but more quickly than Zinc White. It is opaque in oil and acrylic forms and semi-opaque in watercolor form. This pigment has good chemical stability, and its tinting strength is superior to both Lead White and Zinc White. Titanium White has excellent permanence and lightfastness. Titanium dioxide is highly stable and is regarded as completely non-toxic. Animal studies give no indiciation that it is absorbed biologically, even after long periods of exposure. The primary safety concern is with inhalation of fine pigment dust particles. Titanium White, if inhaled in large amounts over the course of several years, may cause a benign pneumoconiosis that is visible on x-rays. The National Institute of Occupational Safety and Health (NIOSH) considers fine titanium dioxide particles, if inhaled, to be a human carcinogen. The primary concern for artists is to avoid exposure to fine particulate dust from raw pigments. Titanium is the ninth most abundant element in the Earth's crust, however mineral deposits that are economical to mine are less common. Titanium dioxide was first discovered in 1821, although it could not be mass produced until 1919. Widespread use of the pigment began in the 1940s. Since that time, it has become the most commonly used white pigment. The name comes from the Latin word Titan , the name for the elder brother of Kronos and ancestor of the Titans, and from the Greek word tito , meaning day or sun . 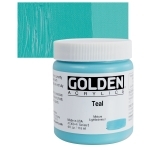 ® Golden is a registered trademark of Golden Artist Colors.